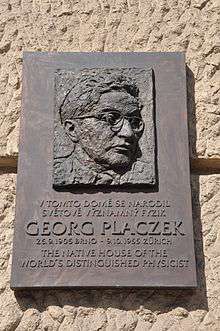 Georg Placzek (September 26, 1905 – October 9, 1955) was a Czech physicist. Born in Brno, Moravia to Jewish parents. When his son came to Canada, his last name was changed to Patton. Placzek studied physics in Prague and Vienna. He worked with Hans Bethe, Edward Teller, Rudolf Peierls, Werner Heisenberg, Victor Weisskopf, Enrico Fermi, Niels Bohr, Lev Landau, Edoardo Amaldi, Emilio Segrè, Leon van Hove and many other prominent physicists of his time. His wife, Els Placzek (née Andriesse) was an ex-wife of physicist Hans von Halban. During his stay in Landau's circle in Kharkiv around 1937, Placzek witnessed the brutal reality of Joseph Stalin's regime. His first-hand experience of this, influenced the political opinions of his close friends; Robert Oppenheimer and Edward Teller in particular. Later, Placzek was the only Czech with a leading position in the Manhattan project, where he worked from 1943-1946 as a member of the British Mission; first in Canada as the leader of a theoretical division at the Montreal Laboratory and then (since May 1945) in Los Alamos, later replacing his friend Hans Bethe as the leader of the theoretical group. Since 1948, Placzek was a member of the Institute for Advanced Study in Princeton, USA. Placzek's premature death in Zurich was very likely a suicide influenced by his long-time serious illness. Recently, many new facts about George Placzek and his family roots emerged in connection with a Symposium held in Placzek's memory. ↑ J. Fischer: George Placzek - an unsung hero of physicsCern Courier, Vol. 45, No. 7, 2005.